Filling our homes with relics from the past, made with love and for longevity, gives good energy to a space undoutably. One of my favourite in our home is a quilt, which was gifted to my husfriend and I by The House of WanderingSilk. Like in North America, quilts have a long history in India; from the koudis of Karnataka, and kanthas of Bengal, to the ledras of Jharkhand, and gudris of Rajasthan. 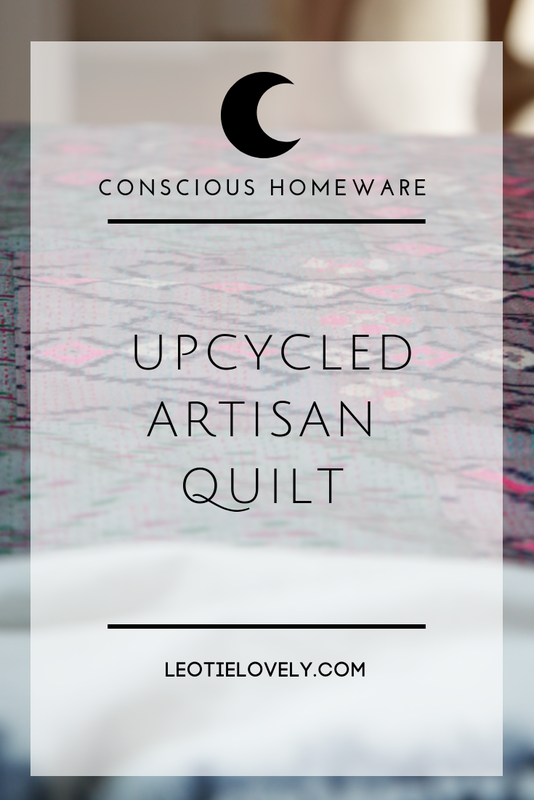 It is the age old domestic art of upcycling, repurposing tattered bed sheets, outgrown clothing and old dresses into patchworks of perfection. The final creation is a specimen of fine art, each one infused with creative energy, like any other art. This fine but fading skill has been passed down through the generations since the ralli quilts of the Indus Valley Civilization of the Bronzed Age. The richness of ralli quilts showed the family’s prosperity back then, and women would sit before their wedding for months to create a piece representative of their story. In India it is a tradition rife with spiritual significance and folk meaning, whether made for ones self or given as a gift. Our quilt was produced by a women’s group based in Himachal Pradesh, in Northern India. The collective provides members with regular employment, living wages, training, and flexible working conditions, allowing women to work from home should they choose. Each quilt is made from beautiful sari remnants left over from the production of The House of Wandering Silk’s kathna sari scarves. The artisans iron, cut, place and sew the small patches together, then hand quilt the finished blanket. The results are stunning, a million heartfelt stories stitched together into its own unique tale. Not since I was an infant, and slept under a pink rainbow quilt my Aunt handmade for me, have I ever had such a love filled creation cover me while I dream. In many ways, keeping artisan skills alive, keeps meaning alive. We will never look back at that H&M, Target, or Urban Outfitter's blanket and find any depth. It's just a thing. It's empty and void of the tales the skills artisans hold can tell. You can encourage and support the growth and continuation of these heritage skills by voting with your dollar and supporting artisans who are paid fairly to keep the spirit of substance among us. 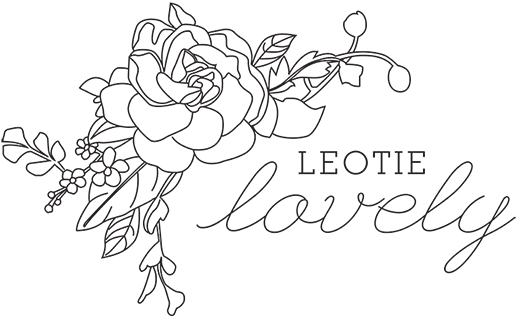 You can find the beautiful creations HERE , they let you choose your own unique design when you purchase, selecting from the completed colour combinations available. Pure magic. 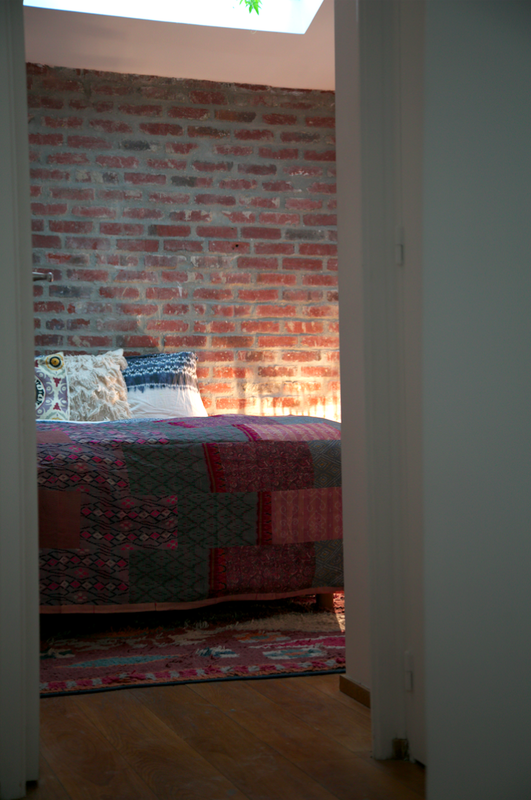 We have an exposed brick wall in our bedroom, too! It looks the quilt was made for your new home! A beautiful write up.